NanoRacks has wrapped up a bridge round of investments that will support the company’s efforts to produce an airlock technology designed for the International Space Station. New York-based financial services company Space Angels led the funding round to help expedite the production of Commercial Airlock Module, NanoRacks said Tuesday. NASA and NanoRacks signed a Space Act Agreement last year to integrate the private airlock module onto ISS. 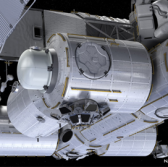 NanoRacks will also collaborate with Boeing to fabricate and install the airlock’s passive common berthing mechanism under a partnership agreement announced in February. The airlock is designed to help increase U.S.’ capacity to deploy small satellites, payloads and other equipment via the space station.